John Gerard (1545-1612) in his book, The Herball or Generall Historie of Plantes. 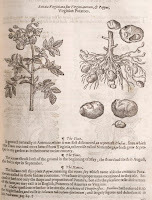 London: 1633, included a picture of the white potato which he labeled Virginian Potatoes. It is supposed to be the earliest published image. Later they were called 'white potato' or 'Irish potato' - as seen in the recipe by Mary Randolph, below. 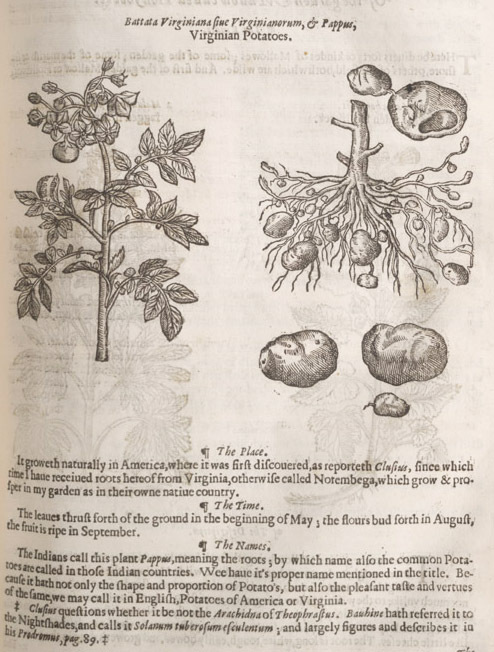 A sweet potato plant, or Spanish Potatoes appeared in Botanologia by William Salmon in 1710. Click to enlarge. Randolph's recipe for sweet potato pie concluded with a comment that "Irish potato pudding is made in the same manner, but is not so good." Actually both are delicious - made with butter, eggs, sugar, brandy, nutmeg and lemon zest. Randolph suggests only one pound of potatoes to 3/4 of butter. Elizabeth Ellicott Lea (1851) had 1 1/2 pounds of potatoes, with the rest of the ingredients the same. In the 18th century, the 1774 edition of Hannah Glasse's The Art of Cookery, Made Plain and Easy contained three recipes for potato puddings (pie) with the third recipe specifying white potatoes. Two pounds of potatoes to 1/2 pound butter is the base, with eggs, nutmeg, cream, sack in a puff paste. So, to recap the potato to butter ratio. I have always been amazed that Randolph has 1 pound - ONE large sized sweet potato - to 3 sticks of butter. That's alot of butter. Glasse had 2 pounds to 2 sticks of butter. TAKE two pounds of white potatoes, boil them soft, peel and beat them in a mortar, or strain them through a sieve till they are quite fine; then mix in half a pound of fresh butter melted, then beat up the yolks of eight eggs and three whites, stir them in, and half a pound of white sugar finely pounded, half a pint of sack, stir it well together, grate in half a large nutmeg, and stir in half a pint of cream, make a puff-paste, and lay all over your dish and round the edges; pour in the pudding, and bake it of a fine light brown.